Not to be confused with moonlight. For other uses, see Moonshine (disambiguation). 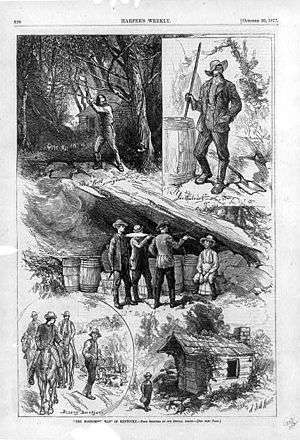 The Moonshine Man of Kentucky, an illustration from Harper's Weekly, 1877, showing five scenes from the life of a Kentucky moonshiner. Moonshine, white liquor, white lightning, mountain dew, hooch, homebrew, white whiskey, and corn liquor are terms used to describe high-proof distilled spirits that are often but not always produced illicitly. Moonshine is typically made with corn mash as the main ingredient. Liquor-control laws in the United States that prohibit moonshining, once consisting of a total ban under the 18th Amendment to the United States Constitution, now center primarily on evasion of revenue taxation on spiritous and/or intoxicating liquors, and are enforced by the Bureau of Alcohol, Tobacco, Firearms and Explosives of the United States Department of Justice; such enforcers of these laws are known by the often derisive nickname of "revenooers". 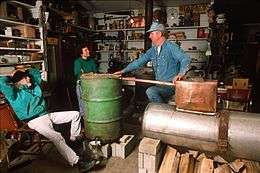 The word "moonshine" is believed to be derived from the term "moonrakers" used for early English smugglers and the clandestine nature of the operations of the illegal Appalachian distillers who produced and distributed whiskey. The distillation was done at night to avoid discovery. Moonshine was especially important to the Appalachian area. This white whiskey most likely entered the Appalachian region in the late 18th century to early 1800s. Scots-Irish immigrants from the province of Ulster in the north of Ireland brought their recipe for their uisce beatha, Gaelic for "water of life". The settlers made their whiskey without aging it, and this is the same recipe that became traditional in the Appalachian area. In the early 20th century, moonshine became a key source of income for many Appalachian residents like Marvin "Popcorn" Sutton, since the limited road network made it difficult and expensive to transport corn crops. As a study of farmers in Cocke County, Tennessee, observes: "One could transport much more value in corn if it was first converted to whiskey. One horse could haul ten times more value on its back in whiskey than in corn." Moonshiners in Harlan County, Kentucky, like Maggie Bailey, made the whiskey to sell in order to provide for their families. Others, like Amos Owens, from Rutherford County, North Carolina and "Popcorn" Sutton from Maggie Valley, North Carolina sold moonshine to nearby areas. Marvin "Popcorn" Sutton's life was covered in a documentary on the Discovery Channel called "Moonshiners". The legendary bootlegger once said that the malt ( a combination of corn, barley, rye) is what makes the basic moonshine recipe work. In modern usage, the term "moonshine" ordinarily implies that the liquor is produced illegally; however, the term has also been used on the labels of some legal products as a way of marketing them as providing a similar drinking experience as found with illegal liquor. Poorly produced moonshine can be contaminated, mainly from materials used in the construction of the still. Stills employing automotive radiators as condensers are particularly dangerous; in some cases, glycol, products from antifreeze, can appear as well. Radiators used as condensers also may contain lead at the connections to the plumbing. These methods often resulted in blindness or lead poisoning for those consuming tainted liquor. This was an issue during Prohibition when many died from ingesting unhealthy substances. Although methanol is not produced in toxic amounts by fermentation of sugars from grain starches, contamination is still possible by unscrupulous distillers using cheap methanol to increase the apparent strength of the product. Moonshine can be made both more palatable and less damaging by discarding the "foreshot"—the first few ounces of alcohol that drip from the condenser. The foreshot contains most of the methanol, if any, from the mash because methanol vaporizes at a lower temperature than ethanol. The foreshot also typically contains small amounts of other undesirable compounds such as acetone and various aldehydes. 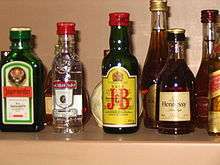 Alcohol concentrations above about 50% alcohol by volume (101 proof) are flammable and therefore dangerous to handle. This is especially true during the distilling process when vaporized alcohol may accumulate in the air to dangerous concentrations if adequate ventilation has not been provided. A common folk test for the quality of moonshine was to pour a small quantity of it into a spoon and set it on fire. The theory was that a safe distillate burns with a blue flame, but a tainted distillate burns with a yellow flame. Practitioners of this simple test also held that if a radiator coil had been used as a condenser, then there would be lead in the distillate, which would give a reddish flame. This led to the mnemonic, "Lead burns red and makes you dead." or "Red means dead." Although the flame test will show the presence of lead and fusel oils, it will not reveal the presence of methanol (also poisonous), which burns with an invisible flame. A more reliable method of testing is to use scientific testing equipment, such as an alcoholmeter or hydrometer. A hydrometer is used during and after the fermentation process to determine the potential alcohol percent of the moonshine, whereas an alcoholmeter is used after the product has been distilled to determine the volume percent or proof. 1 2 Guy Logsdon, Oklahoma Historical Society. "Moonshine". Encyclopedia of Oklahoma History & Culture. Oklahoma State University. Archived from the original on 2014-10-31. Retrieved 21 March 2014. ↑ "What Is Moonshine? Is Moonshine Illegal? – The Famous Illegal Drink of Yore". Flasks.com. 2013-08-27. Retrieved 2015-05-04. ↑ Ellison, Betty Boles (2003). Illegal Odyssey: 200 Years of Kentucky Moonshine. IN: Author House. p. 1. ISBN 978-1-4107-8407-0. ↑ Kellner, Esther (1971). Moonshine: its history and folklore. IN: Bobbs-Merrill. p. 5. ISBN 978-0517169667. ↑ Jason Sumich. "It's All Legal Until You Get Caught: Moonshining in the Southern Appalachians". Appalachian State University. Retrieved 21 March 2014. ↑ Joyce, Jamie (2014). Moonshine: A Cultural History of America's Infamous Liquor. Minneapolis: Zenith. pp. 8–14. ISBN 978-0-7603-4584-9. ↑ Peine & Schafft 2012, p. 98-9. ↑ Block, Melissa (2005-12-08). "'Queen of the Mountain Bootleggers' Maggie Bailey". National Public Radio. Retrieved 2015-05-04. ↑ "Popcorn Sutton Moonshine Recipe". Whiskey Still Company. ↑ Peine & Schafft 2012, p. 97. ↑ "Distillation: Some Purity Considerations". Moonshine Still. Retrieved 2015-05-05. ↑ "Moonshine". Skylark Medical Clinic. Archived from the original on 2011-07-16. Retrieved 2008-07-23. ↑ "Methanol fueling infrastructure for fuel cell vehicles needs assessment. Research program outline". Methanol Institute. Archived from the original on 2007-06-26. ↑ "Alcoholmeter or Hydrometer: Do You Know the Difference?". Retrieved 2014-10-28. Peine, Emelie K.; Schafft, Kai A. (Spring–Fall 2012). "Moonshine, Mountaineers, and Modernity: Distilling Cultural History in the Southern Appalachian Mountains". Journal of Appalachian Studies. Appalachian Studies Association. 18: 93–112. JSTOR 23337709. "Moonshine 'tempts new generation'" – BBC on distilling illegal liquor in the 21st century.